As Research & Policy Officer at UKCDR, Yaso is responsible for providing research and policy advice to UKCDR member organisations (BEIS, DFID, DHSC, UKRI and Wellcome) and key stakeholders. She joined UKCDR in December 2015 and has over 16 years’ experience in international development. Her areas of expertise span across evidence into policy, research uptake, knowledge mobilisation, partnerships, capacity development and networks. Yaso leads UKCDR’s work on research capacity strengthening. 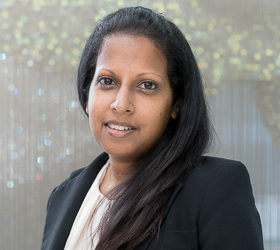 She chairs the UKCDR Research Capacity Strengthening Group (RCSG) which brings together over 20 funder and practitioner organisations to share, learn, connect and improve practice. She also leads on UKCDR’s responses to parliamentary inquiries and manages relationships with GCRF/UKRI, Wellcome, NERC and ESRC. She recently coordinated a cross-funder task group on mapping UK links with CGIAR centres and conducted a mapping on ODA AMR research. Yaso has a BSc in Geography, and spent over eight years at the Institute of Development Studies (IDS) working to strengthen the capacity of research institutes, intermediaries, think tanks and NGOs in promoting evidence-informed policy and practice. Her work also took a critical look at the role of knowledge brokers in international development. Prior to this Yaso was Programme Manager for Book Aid International, supporting library development in Africa and Asia.